Indigenous creative expression is gaining momentum by occupying space as murals on Toronto’s concrete walls. The city as “project space” extends beyond graffiti, postering, flag-raising and site-specific public artwork to address an Indigenous presence located across the GTA. Recent murals speak to land acknowledgement, history and honoring as means to recognize Indigenous tradition, knowledge and beauty. The Mural of the Story brings together a panel of artists including Tannis Nielson, Philip Cote, Tia Cavanagh and Jason Baerg, who will introduce and discuss their recent mural projects and how they activate community and insert Indigeneity within the urban landscape. The mini-symposium is supported by the Indigenous Visual Culture Program in conjunction with the winter course Language and the Land. Jason Baerg is an Indigenous curator, educator, and visual artist who graduated from Concordia University with a Bachelors of Fine Arts and a Masters of Fine Arts from Rutgers University. He currently is teaching as the Assistant Professor in Indigenous Practices in Contemporary Painting and Media Art at OCAD University. For more information about his work, please visit Jasonbaerg.com. Tia Cavanagh, originally from the northern shores of Lake Huron in Ontario, has also lived and studied in Havelock, Norwood, Peterborough, Montreal and Toronto. Achieving her BFA at OCAD university she now studies at Trent University working on her Masters degree in Indigenous methodologies applied to art making. Tannis Nielsen is a Métis Woman (of Saulteaux/Anishnawbe and Danish descent,) with twenty years of professional experience in the arts, cultural and community sectors, and ten years teaching practice at the post-secondary level. Tannis holds a Masters in Visual Studies Degree (M.V.S.) from the University of Toronto, an Art and Art History-Specialist Degree from U of T, as well as a Diploma in Art and Art History from Sheridan College, in Oakville, Ontario. Philip Cote is an artist, an educator, and a Sweat Ceremony leader. A graduate of OCAD University’s Interdisciplinary Master’s in Art, Media and Design in 2015, Philip creates opportunities for teaching methodologies on Indigenous symbolism, language, knowledge, and history. His teaching philosophy comes from his personal experience of Active Participation and experiential learning through his work as Indigenous knowledge and wisdom keeper, and observations through land-based pedagogy. OCAD University hosts film and video marathon and interactive mural for Nuit Blanche! Multiplex, curated by The Modest Eyes collective, is an all-night video and essay-film marathon of work by local and international artists and designers. Sit in a theatre, join an on-site slumber party or use your mobile device to plunge into the streams of image, sound and text to experience the marathon in your own way. A list of programming, artists and artworks can be seen at The Modest Eyes website. OCAD U is also the site of The Merging. Artist Nicola Verlato’s interactive mural on the front of the main campus building at 100 McCaul St. depicts two of Toronto’s most prominent historic figures: communications theorist Marshall McLuhan and mathematician Donald Coxeter. Using an app on their mobile devices, viewers can see elements of the mural float in space like 3D objects. A second version of the mural inside OCAD U’s Great Hall lets people enter the painting using the app. The Merging is one of 10 projects in the city-produced exhibition Militant Nostalgia, curated by Paco Barragán. Location: OCAD University, 100 McCaul St., Toronto. Wheelchair accessible at front doors. 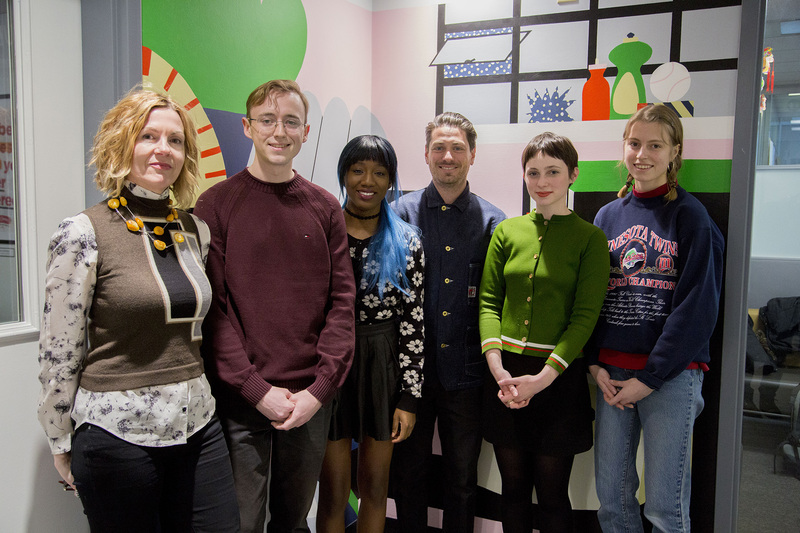 Read more about OCAD University hosts film and video marathon and interactive mural for Nuit Blanche! 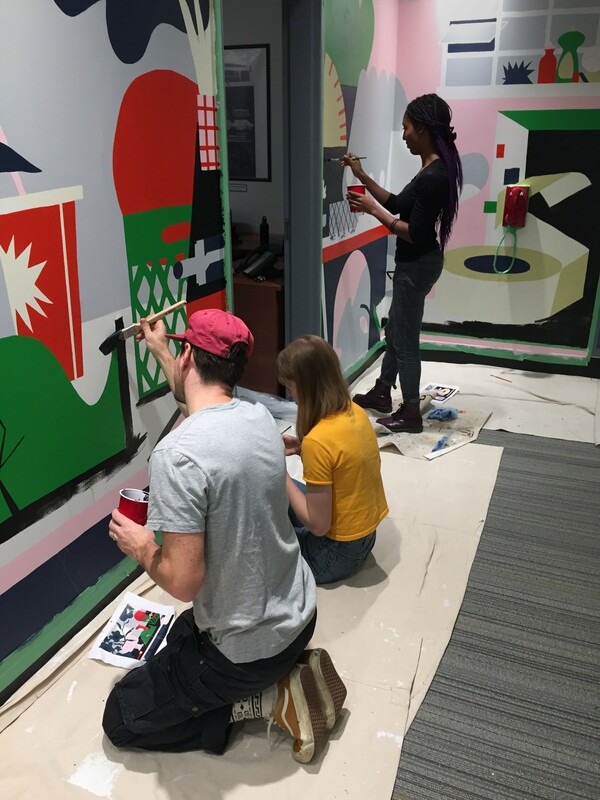 Congratulations to 3 Illustration students: Kendra Yee (3rd year) and alums Meaghan Way and Meg Dearlove who painted a large mural at Peter Street and Richmond Street (see attached picture). This student project with Carlyle Communities started back in November 2015 and now is a reality. The TTC subway at Union Station, Toronto’s main public transportation hub, is acquiring an extraordinary, world-class art installation, which is presently being installed and will be unveiled in time for the Pan Am Games. Created by awardwinning Canadian artist Stuart Reid, zones of immersion is a 7-foot high by 500-foot long richly worked glass wall that portrays the people who “ride the rocket” every day. Reid’s evocation of our city’s “third class carriage” is rooted in a history that these images’ very line and media evoke—Honoré Daumier, Gustave Courbet, José Clemente Orozsco—and which their nod to both Social Realism and Impressionism implies. However, Reid’s subjects embody a common experience made contemporary. Scrawled with clipped texts of overheard conversation and passing allusion, Reid’s works capture the present moment through language. He circles our intimacy, investigates our autonomy, and portrays the human connections that are both performed and pressed between stations. How do we use the space we travel in order to get the time we need? With his subjects either moving out of frame, responding through posture or retreat, crushed against one another or framed alone, Reid produces a record of the river of movement that happens beneath our feet – one of isolation in crowds, community and class. These works specifically reflect on the human condition within urban transit – a world both intensely collective and remarkably isolated... a world where the anonymity of the no man’s zone offers us an unvarnished glimpse into the face, and hence perhaps a sliver of the psyche of one’s fellow passengers. I am interested in drawing that reveals the interrelationship of the ‘self’ and the ‘other’ with both empathy and freedom. Stuart Reid was born in London Ontario. He studied with Paterson Ewen, Greg Curnoe, Richard DeMarco, Patrick Reyntiens and Joseph Beuys. He holds a B.A. (fine arts ) from the University of Guelph and a Masters of Architecture from UCLA. He is a professor at OCAD University. His many major public artworks include works for Holland Bloorview Kids Rehabilitation Hospital, Intercontinental Toronto Centre, Salzburg Congress. His artwork at St. James’ Cathedral was unveiled by Queen Elizabeth in July 1997. He is the great nephew of the early Canadian painter G.A.Reid. Gallery Gevik welcomes visitors Tuesday to Saturday 10:30 am to 6 pm.